Cycling from Luang Prabang to Vientiane is an incredible way to experience Laos. Avoiding all the major highways and getting way off the beaten track, this cycling adventure will take you through national parks, rivers and rainforests. Along the way you’ll engage with and learn from local NGOs (small charities) in regards to the effect of unexploded land mines across the region, enjoy delicious local food and visit multiple UNESCO heritage sites. 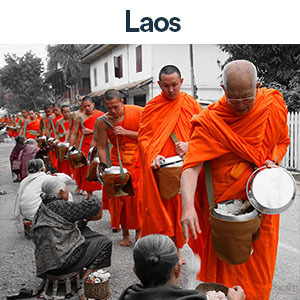 A landlocked paradise, Laos truly delivers the best of South East Asia in one modest, yet impressive package. To make the most of Laos, we stay in a variety of different accommodation styles. In Luang Prabang, we stay in Villa Saykam, a beautiful French colonial style building in the heart of the UNESCO World Heritage City. Once we move away from the major towns and into the rural villages, we stay in clean & comfortable guest houses. All local guesthouse rooms have their own private bathroom with a western toilet. Just before we get to Vientiane, we stay at Long Ngum View resort, with a pool to relax view the mountains by. In 2018, the Cycle Vietnam to Laos adventure is co-hosted by Social Cycles founder Brett Seychell. Brett is passionate about sustainable travel and enriching experiences by engaging with local experts. That’s why he will co-facilitate the 2018 tours and connect riders with local experts. To obtain an authentic Laos experience and truly gain from local knowledge, the adventure is co-hosted by a local Laos bike expert, Toh, based in Luang Prabang. In Laos, we have a great range of bikes that are designed to deal with the local environment perfectly. The bikes used are either Trek 3900 and/or Giant Rincon mountain bikes. Each mountain bike comes with a helmet, lock, comfortable gel seat and a handlebar bag. All mountain bikes have a 24 speed gear set to help you get up and down those hills! The overall distance, should you cycle the whole way, is just over 500km over the 5 cycling days. In addition to that, there are a lot more hills than there is flat. More often than not, you’re either going to be climbing a mountain, or flying down! It can sound a little daunting, but with the aid of the support van, you can cycle as much or as little as you like. Should you choose, you can even just cycle the downhill! We’ll start the day from 8am and cycle at a relaxed pace throughout the day, allowing time for plenty of rest stops, coffee stops and food. When you’ve had enough, you can jump in the van. The group will retire from the day about 4pm, regardless of the distance cycled during the day. Friends International are leading the charge in the ‘ChildSafe’ movement and the ‘Think Families, Not Orphanages’ campaign. Friends International have a restaurant in Luang Prabang, which makes for a great introduction to Laos. Their programs of ‘Saving Lives’ and ‘Building Futures’ have been used as templates all over the world. Lone Buffalo Foundation are committed to improving opportunities for young people through English study and football coaching. LBF aims to enhance the opportunities for careers in the business and tourism sectors for Phonsavan’s young people. Quality of Life Association provides support to UXO victims, people with disabilities and UXO affected communities in Xieng Khouang province, Lao PDR. Arrive at the beautiful UNESCO world heritage city of Luang Prabang and spend the day at your leisure. There’s a feast of exciting activities to sink your teeth into. Spend your day exploring around the many markets. The day is yours to potter, caffeinate and watch the world go by. The group will meet up for dinner at 6pm at the hotel, where we’ll dine at a social enterprise based vocational training restaurant, supporting Friends international. The ancient town of Luang Prabang was designated a UNESCO World Heritage Site in 1995. 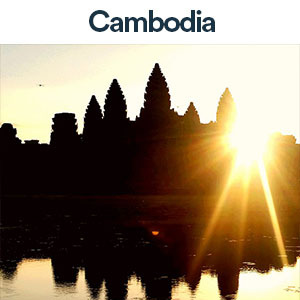 French architecture, glistening temples and extensive natural beauty make this the premier destination for travellers throughout all of South East Asia. we’ll dig a little deeper and learn from a local NGO about their programs and strategies to empower the local population and provide opportunity for education and growth. In the afternoon we’ll jump out of town and go for a dip in Kuangsi waterfalls. Congratulations! You’ve cycled Laos, covered almost 510km in the saddle and more than scratched the surface as to what this fantastic country is all about. We’ll enjoy a final breakfast together before we get you off to the airport and on your way home.